What a great week of Java. First there was the community driven conference of JavaLand in the theme park Phantasialand in Brühl near Cologne, then there was the Java User Group Darmstadt meeting with speaker David Blevins @dblevins, accompanied by Stephen Chin @steveonjava and Sebastian Daschner @DaschnerS. I went to both, there is already nice coverage on JavaLand 2016, therefore I will write about the later. 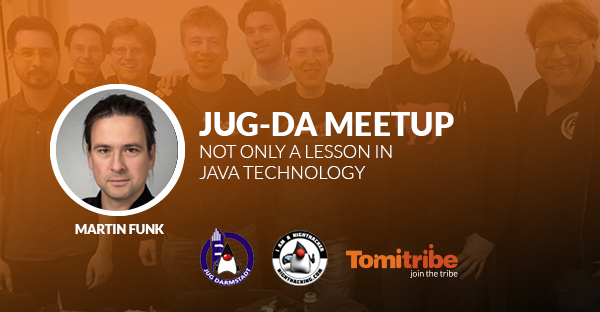 JUG-DA attracted David to come to Darmstadt and give an interesting talk on hidden gems of Java EE and the role of functional programming therein. David’s talk had the main part of the meeting, but it shouldn’t go unmentioned that Stephen and Sebastian joined in as part of their NightHacking Germany Tour. It was their hardware setup that made the video coverage of JUG meeting possible. For me, this setting really emphasized the nice and respectful atmosphere one finds in the Java Community. Part 1 Extensibility: Shown was a hidden feature inside CDI, a demonstration of the rather unknown gem of custom scopes. It was quite interesting to see what can be done with that feature as it enables developers to drive substantial amount of scope or context oriented code out of business logic closer to the container. Part 2 Functional: This starts out with talking about annotations and their usage in Java EE 6 and Java EE 7. It soon leads to its potential implications with a functional approach offered by Java SE 8. It gives a nice path to imagine what a future Java EE might look like if the capabilities of Lambda Expressions are applied. Good bye declarative annotations, welcome programmatic functions. After that, the JUG was rounded off by Stephen showing NightHacking’s DIY RetroPi Handheld Java Gaming project. That, in itself, would have been worth a whole JUG event, given the set timeframe though it turned out to be only a 10 minute, hands on, introduction. First of all, this was a get your hands on the code, live coding talk; this is an approach that always impresses me the most. This was someone who was not holding tight to his slides, but had the confidence to go right where the code was with all the risk of technical failure in doing so. The talk flowed nicely and at a good pace. David lost me at some points, but since the content that was talked about was so easily accessible, it was fine and encouraged me to get back to the subject later on. And if you do so, don’t be surprised if it takes you more time than the one and a half hours that the video itself is long. At least it did so for me, but go for it, there is lots to be discovered and it’s well worth it. There are undiscovered gems in the land of Java everywhere. It is always worth a second look. Java People and their community are quite approachable.You can reach out to them, they are happy to share what they have to offer. The community is fun and friendly. Though not mentioned above, but explicitly stated in the talk, not only are the people and the community approachable, but the Java language and its whole stack is approachable as well.The JCP process is now open, just go to its homepage and register yourself, its free for individuals. Of course, no one can guarantee you the amount of impact your engagement might have, maybe none, but at least you can be in the front row, you can publish your ideas right where the future of Java is discussed. And even if you feel you have no impact, you can get to know and become known. If your ideas are well founded someone might remember your name. There are always reasons not to engage, but I think they are well outnumbered by the reasons to do so. The event didn’t stop in the lecture hall, a big part of the group found their way to a local pub just a couple of blocks down the road. Pizza and a couple of beers gave a nice atmosphere for further discussions on Java and beyond.